Home / Portfolio / Kate Nash draped in a Brazilian flag: a cultural faux-pas? A photo opportunity in other people’s country can be risky in many ways. In the case of Kate Nash, the British singer, was it a cultural faux-pas? 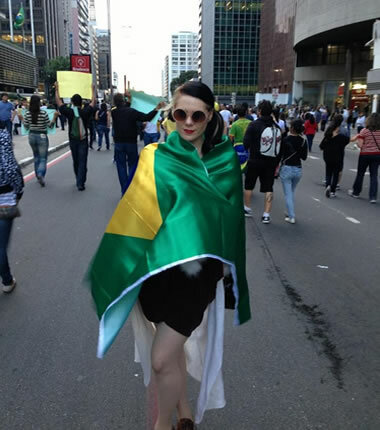 Although not covered by the British press, Brazilian online news outlets are full of comments and negative reactions caused by a picture that Kate Nash posted of herself, on Facebook, draped in a Brazilian flag during protests in São Paulo. The singer was in the city to participate in the Cultura Inglesa Festival (Cultura Inglesa is a well established British English Language School in the country) and, whatever her intention was, her picture did not go down well with Brazilian protesters. Did Kate Nash and her team misread the Brazilian spirit? Comments left on Facebook, in Portuguese, relating to this picture, include “Kate, I love you, but you were not protesting. Do you at least know what these protests are about?” and “You are not protesting, you are posing.” Even the famous Brazilian author Paulo Coelho commented on Kate Nash’s image via Twitter by stating: “Change Brazil but not with Kate Nash ‘protesting’ “. One of course assumes that Kate Nash did not expect this negative reaction from the Brazilian people. At Across we wonder if the singer and her team misread the Brazilian spirit. In our experience, we can safely say that the idea foreigners often have of Brazilians overall is that Brazilians are easy-going and friendly. Many, including Kate Nash and her team, may conclude that this Brazilian response to her picture is out-of- character. If that is the conclusion, the only possible explanation is that the country’s friendly collective character has momentarily been suspended, owing to the tense historical and political moment Brazilians are going through. That being the case, poor Kate misread the Brazilian spirit big time. There is a saying in Brazil that can be literally translated into English as: “I will give you a cow to not enter in a conflict/confrontation but, once I engage in a confrontation, I would let go of the whole cattle ranch if required to avoid stepping down “. That is to mean that Brazilians are not easily distracted when they take a resolve to do something. In this particular case, Kate Nash and her team apparently failed to understand why Brazilians are protesting and consequently, how they would not be easily distracted by her image. The result: from the starting point of being someone with a good fan base in the country, Kate Nash became just the famous foreign artist with little connection with the issues currently being discussed in the country, trying to take advantages of the Brazilians’ good nature. Are Brazilians becoming more sensitive to foreign involvement in local issues? We posted Kate Nash picture on our facebook page (http://on.fb.me/1773dk6) and are currently exploring why Brazilians reacted so negatively to Kate Nash’s picture. Our network of Across co-workers and friends who are locally based, told us that Brazilians do not appreciate when foreigners are seen to become involved gratuitously in very sensitive domestic issues. At the heart of the protests lie questions regarding how best Brazil’s resources can be allocated. Where should Brazil’s priorities lie: in building stadiums or in improving schools, hospitals or the affordability of public transportation? From the comments we’ve heard and read, the main insight that comes through from the Brazilian citizen’s point of view, is that Kate Nash is seen as having taken advantage of tensions, which led to protests, over these crucial issues between the Brazilian government and its people. The message within, directed at the British singer seems to be: ‘Your image does not bring credibility to our social movement because, as a foreigner you can’t even begin to understand what we are protesting about. So, don’t get involved in our local issues’. As an artist, Kate Nash is getting publicity and even negative publicity might be good for her career in Brazil in the future. However, for the moment, she has tarnished her name as an artist in the Brazilian soil. In an age of instant communication, when all conversations are re-posted and shared online, Kate Nash’s picture is a perfect example of cross-cultural communication going wrong. In an ideal world, the artist and/or her team would have consulted with a cross-cultural communication specialist about Brazilian attitudes and moods and would have got some advice on what to say, if anything, on the matter of protests in Brazil. She would also have been given tips as to how to express herself in a way that Brazilians would see her take on the Brazilian protests as a genuine message of support, rather than using the event as a PR opportunity. At Across we believe that cultural faux-pas such as this also happen in the market research industry and it can be avoided. How? Choose country partners that can give you in-depth understanding of the country’s psyche based on the country’s cultural context beyond the present or just what is heard in interviews.